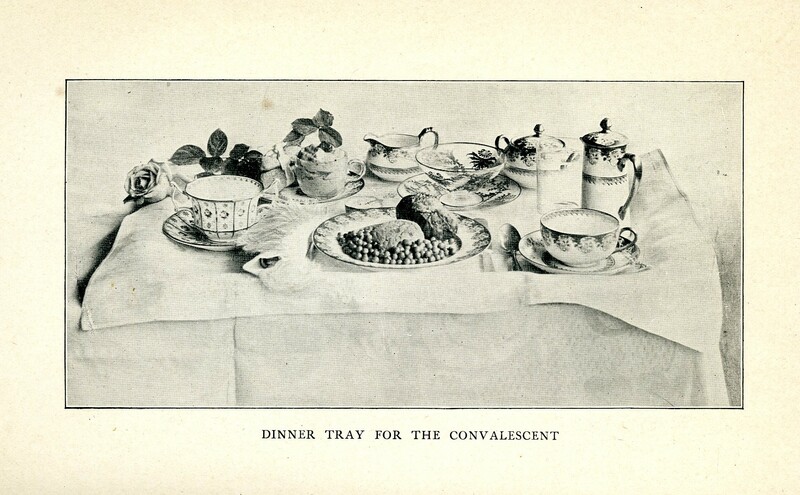 vt – What's Cookin' @ Special Collections?! Nutrition Month…a couple days late! Notes from Newman: HNFE Research and Resources is a blog run by Virginia Tech HNFE Librarian, Rebecca Miller. In honor of Nutrition Month last month, she featured a number of guest posts by HNFE students. For those of you out there particularly interested in nutrition, you may want to check out this series of “Get Your Plate in Shape” posts. 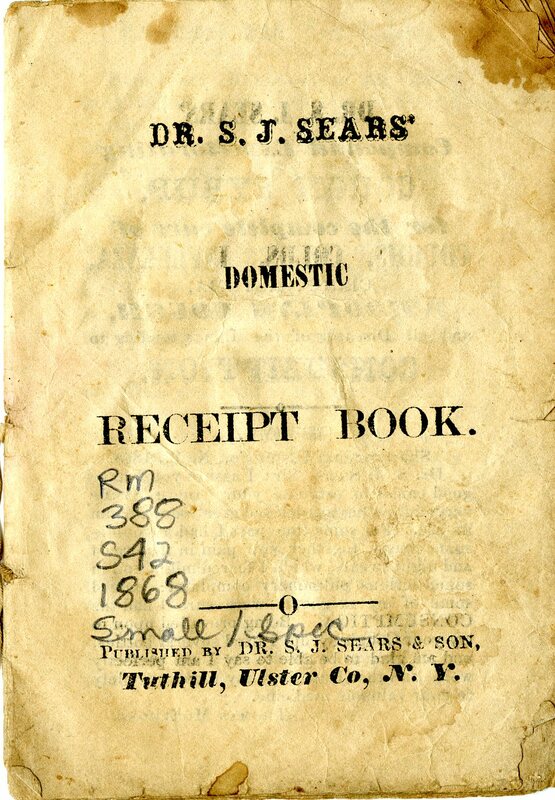 Dr. S. J. Sears’ Domestic Receipt Book, produced in 1868, combines baking recipes, advertisement for Dr. Sears’ cough syrup, and testimonials into a neat, if someone puzzling, package. 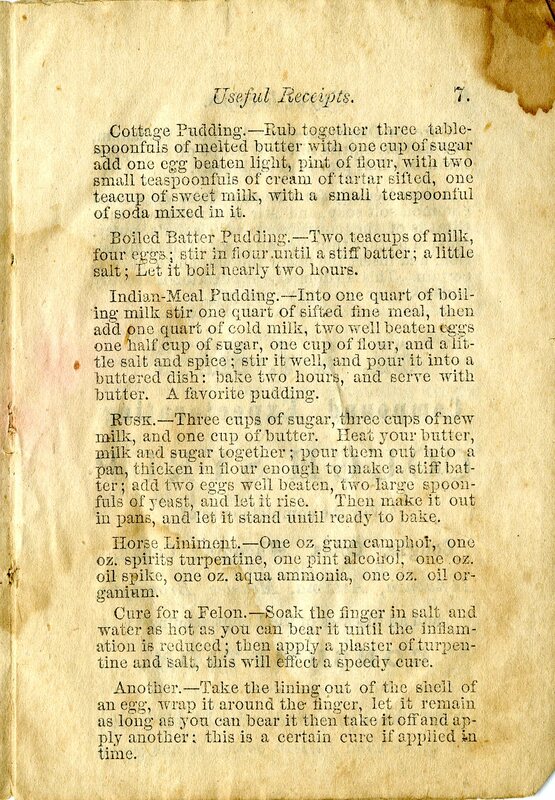 On a single page, there are pudding recipes, directions for making horse liniment, and treatment for infections in the finger. The focus of the little pamphlet, however, are the testimonials. Written by the general public, physicians, and even a minister (and admitted long-term friend) of Sears. 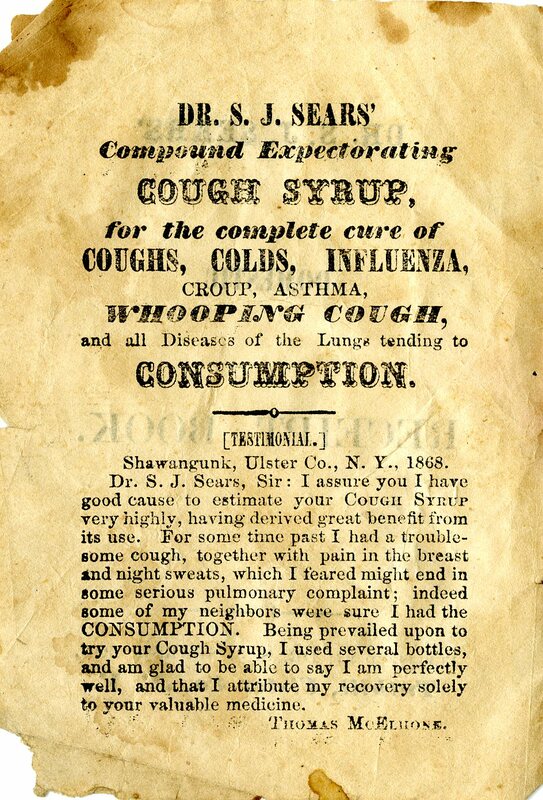 Of course, no one could have a bad word to say about the cough syrup, though in the modern age, one can’t help but wonder about the contents of a bottle. 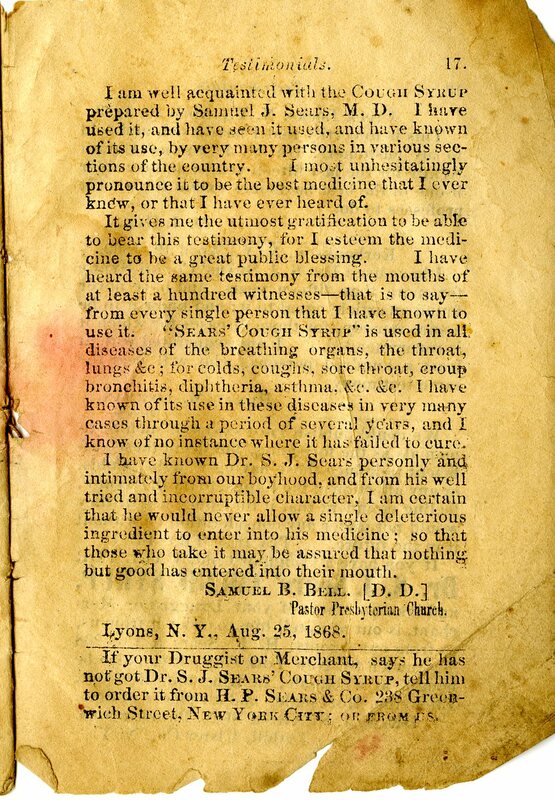 Samuel J. Sears (1815-1894) was a real physician in New York, though, which is more than can be said for some producers of medicines, legitimate or not. Dr. Sears’ syrup, at least, has specific claims and intentions–it is meant for coughs, colds, and a series of other lung-related complaints. When it comes to Dr. Thomas, the claims are not so humble. 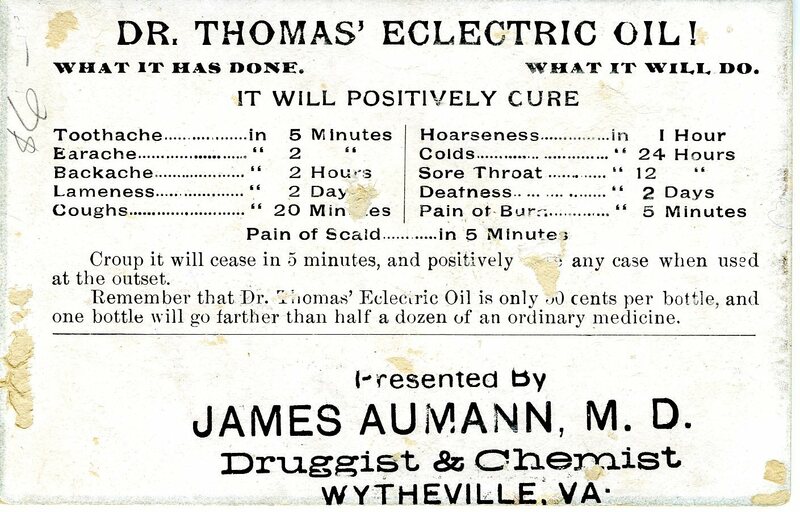 Eclectric oil apparently cures it all! 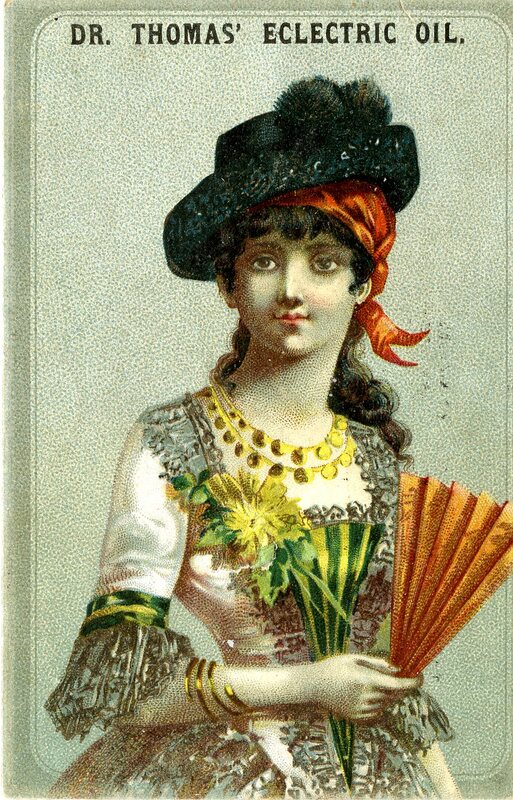 Although the actual date of the trade card is unknown, Dr. Thomas’ oil was marketed from the mid 19th century well into the 20th century in the US and Canada. While it seems unlikely a blend of botanicals (and probably more than a little alcohol) would cure deafness in only two days, it seemed to do something for someone! 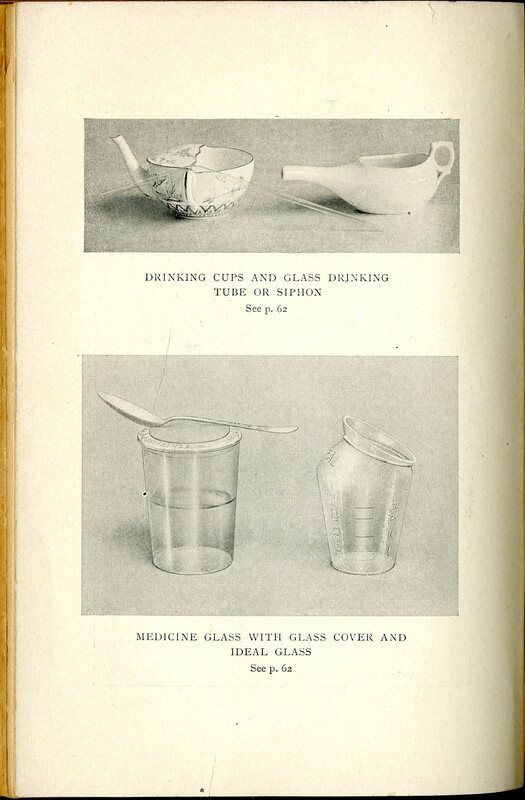 In addition to more patent medicine materials, there is also a great deal of information in our collections relating to home remedies. 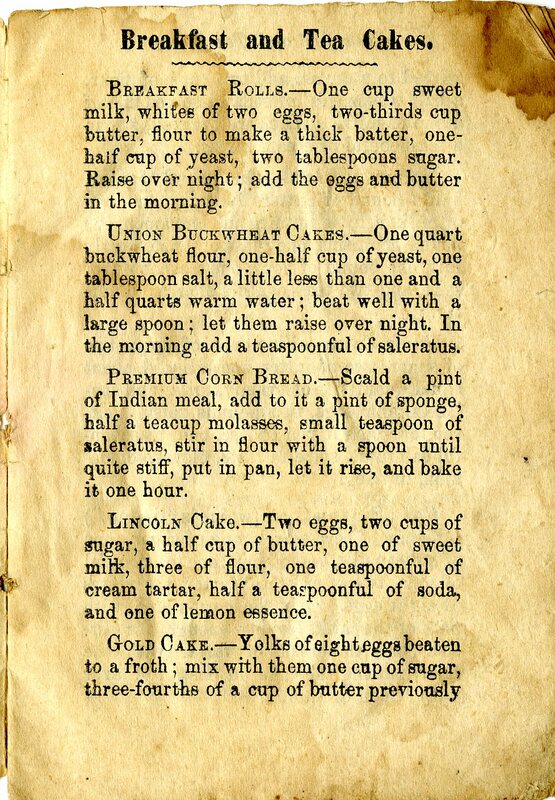 In fact, few 19th century cookbooks with complete without at least a page or two for dealing common injuries and recipes for useful household products. 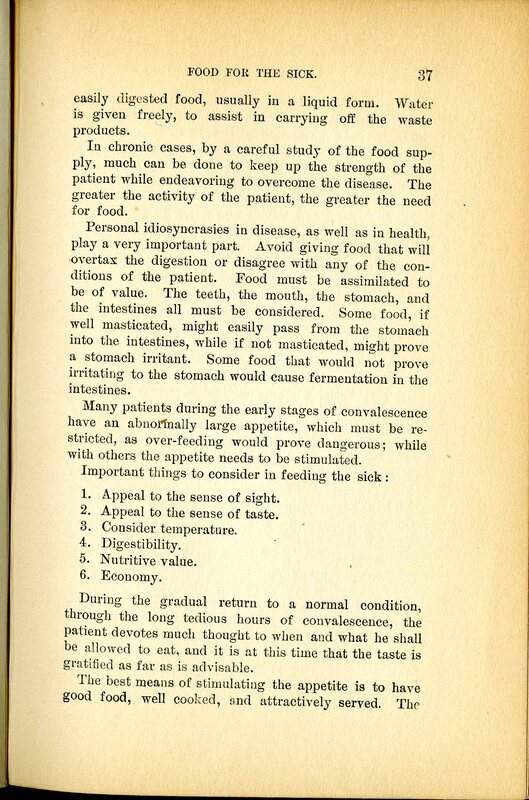 There are a whole range of books devoted in full or partially to the correct foods to feed the sick or invalid, too, but that might just be a blog post for another day…Until then, here’s hoping you don’t require a remedy of any kind. This spring, Newman Library at Virginia Tech is hosting what we hope will became an annual event: an Edible Book Contest! 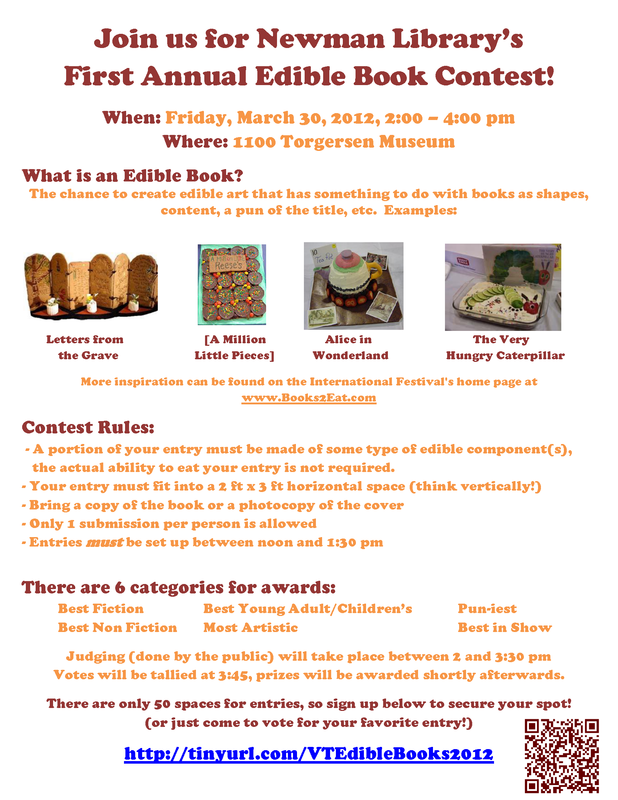 The First Annual Edible Book Contest will be held on Friday, March 30, 2012, from 2-4pm in Torgersen 1100 and we need your help! Below is the flyer for our contest (click on the image for a larger view). Additional information, including rules and the registration, can be found on the contest website: http://tinyurl.com/VTEdibleBooks2012. We only have space for 50 entries, so sign up soon! And even if you don’t want to make something, be sure to join us on March 30. Winners in six different categories will be chosen by attendees and our Edible Book artists want your vote! Hall, Mary Elizabeth. 1912. 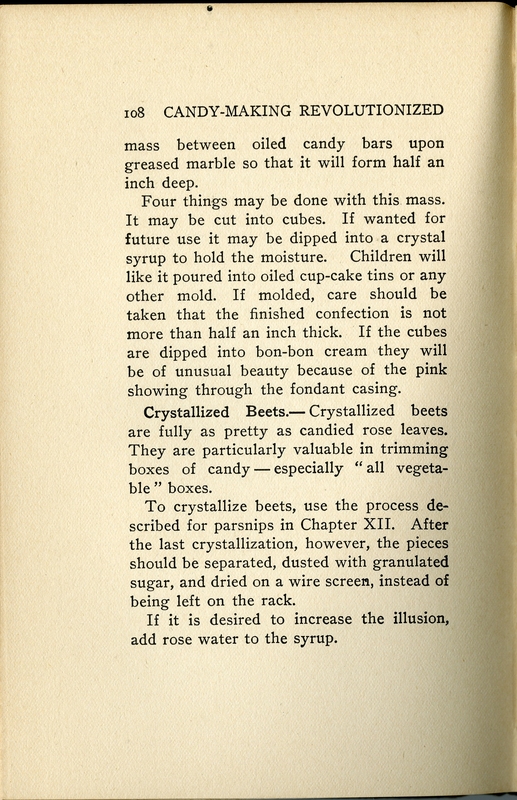 Candy-making revolutionized; confectionery from vegetables. New York: Sturgis & Walton Co. In honor of yesterday’s candy-laden holiday, it seems appropriate to feature, well, candy. 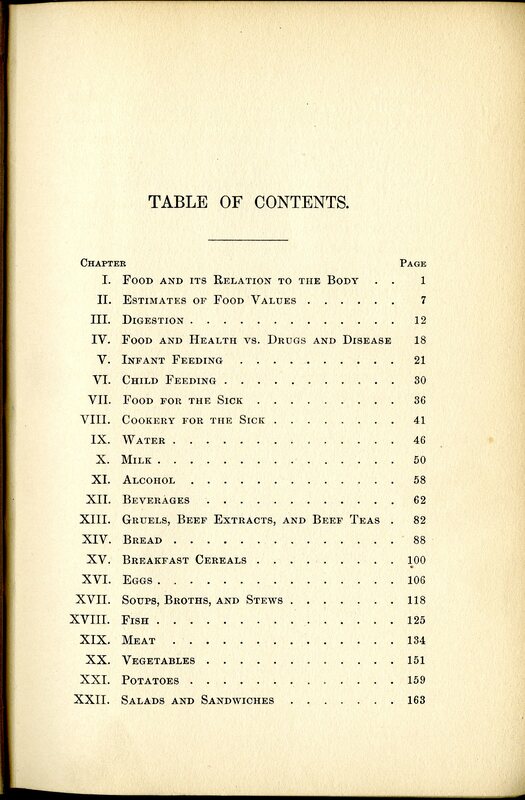 And what good culinary history collection doesn’t have material on that subject? Sure, there are traditional chocolates, candy hearts, chocolate-dipped strawberries, and chocolate cherries. But what if there was something better…something healthier? 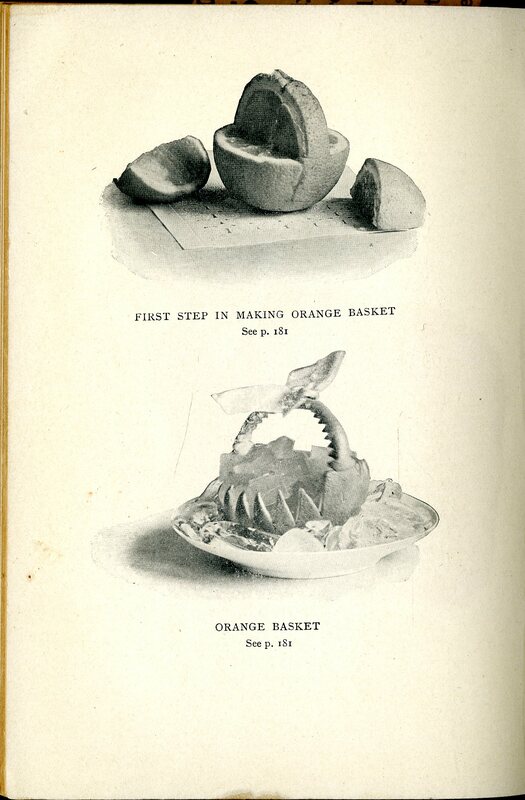 Enter Candy -Making Revolutionized: Confectionery from Vegetables, a book about making candy from vegetables. Seriously. 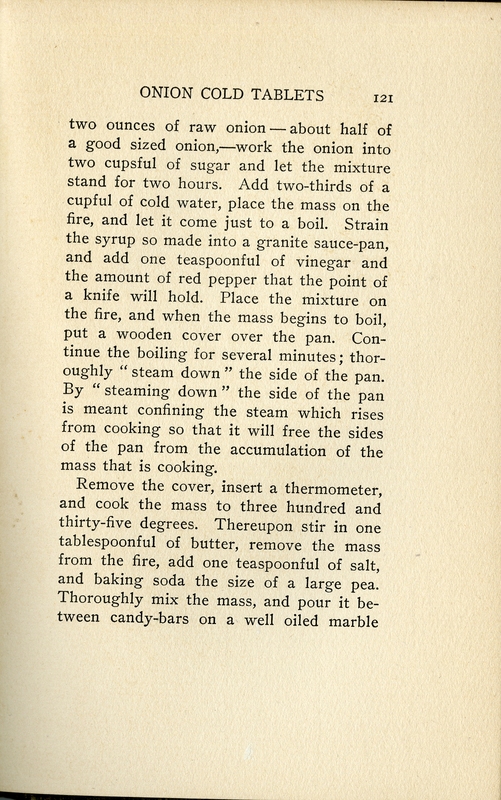 Published in 1912, this little book takes a novel approach to the sweet. 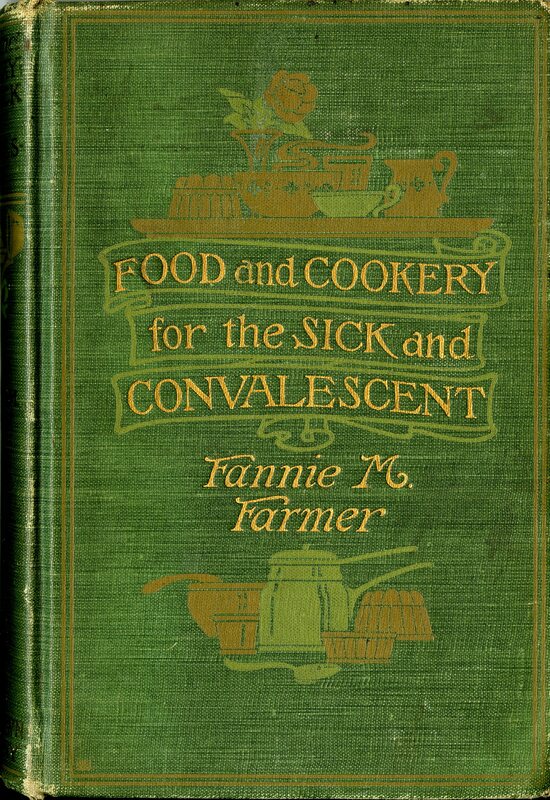 Ranging from root vegetables (potatoes, sweet potatoes, parsnips, beets, and carrots) to fruits (tomatoes and dates) to spices (ginger), the book includes recipes for candies of all sorts. 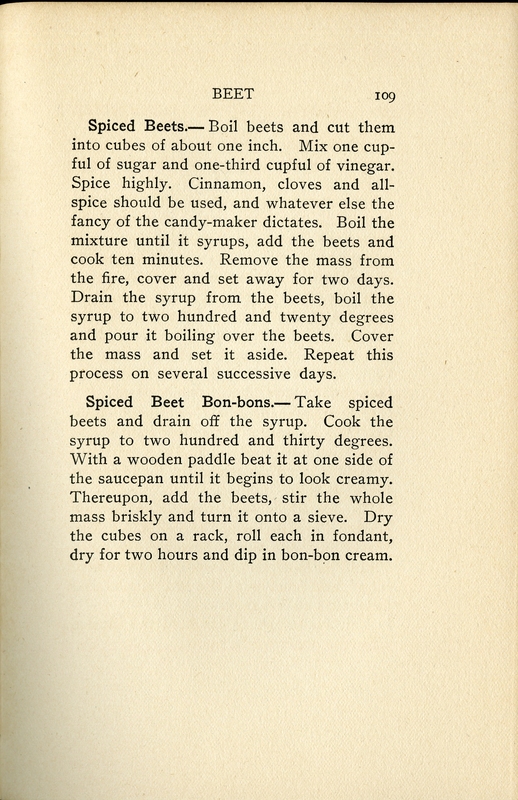 In addition simply crystallizing or candying pieces, there are specific directions on making marshmallows, puffs, creams, bon-bons, nutlettes, and pastilles. 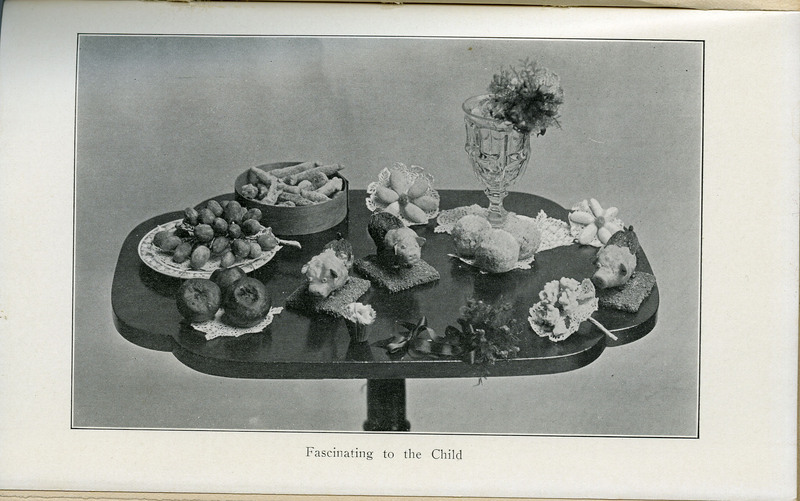 There are instructions for making basic candy you can shape into anything (note the table spread in the image gallery above with its pigs, flowers, and boutonnieres). 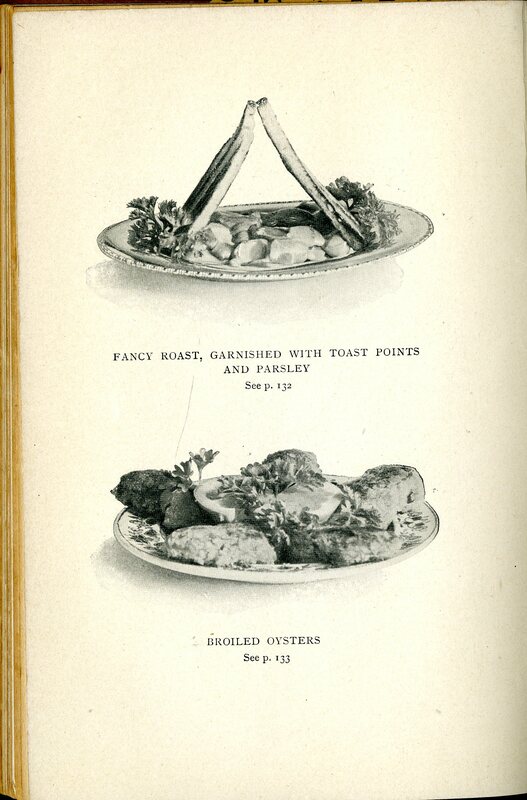 The book includes several chapters on the techniques, as well information for caterers looking to expand their menus and teachers looking to add that little something extra to a class. 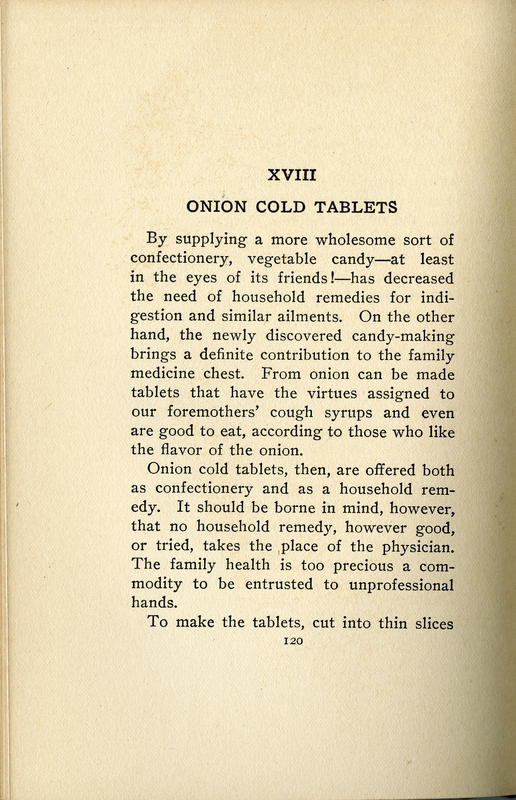 And, like every good recipe book, it contains at least one treatment for sickness–onion tablets! You can read about those in the pages above. 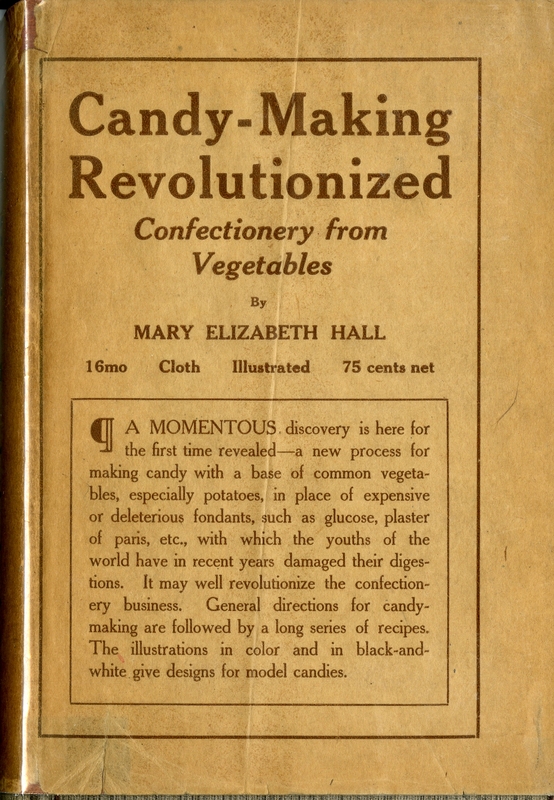 While no one really grabbed hold of Mary Hall’s philosophy, and a majority of our candy is a lot less healthier than it was in her day, there is still some hope. 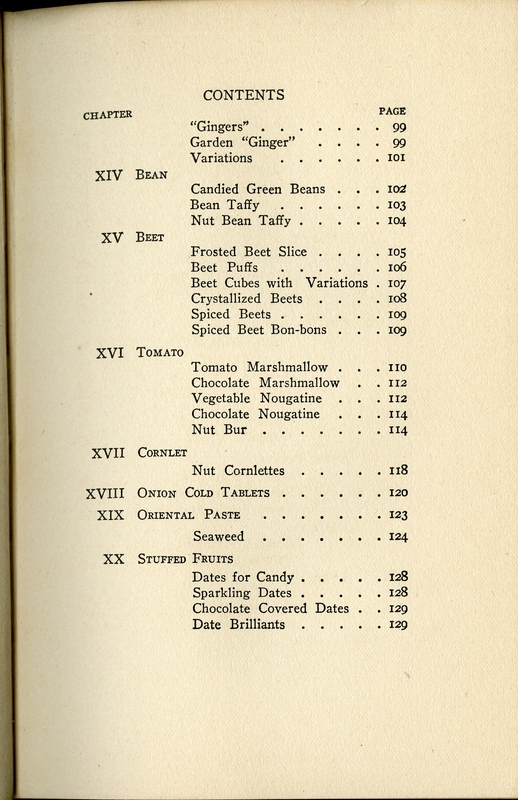 Organic, local, and healthy trends in eating may very well bring us to something close to the green bean taffy and potato caramel of 1912. Besides, when you think about it, is there better way to say “I Love You” than with a decorative box filled with beet puffs, tomato marshmallows, and potato mocha walnuts? Yes, plenty (perhaps but NOT giving someone that box in the first place?)! On the one hand, this book could be a reminder that just because you CAN do something, doesn’t mean you SHOULD. 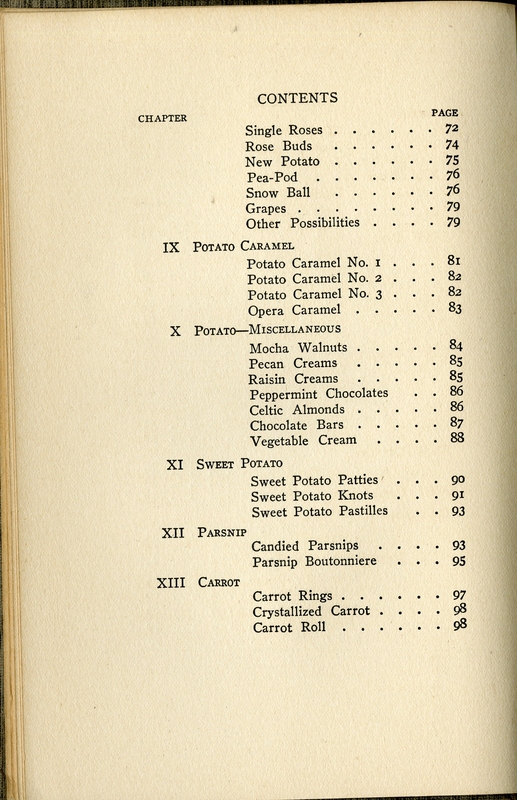 On the other hand, you could do a lot worse than a candied green bean and gingered carrots…right? On a final note, if you can’t come here to see our copy, this book is out of copyright and you can find is online in a number of formats. Special Collections Open House Events! In order to give everyone an opportunity to learn just what goes on here, we’re hosting a series of open house events! This is a great chance to come in, see some materials in a variety of formats and relating to all our different collecting areas (including culinary history, of course! ), take a behind-the-scenes tour, or just meet an archivist and ask questions! We will have four open houses this semester, on the first Tuesday of each month, from 5:30pm-7:30pm. The dates are February 7, March 6, April 3, and May 1. We invite you to drop in for 10 minutes, 30 minutes, or the whole two hours! You can view the Open House Flyer or contact us for more information. Be sure to drop by and spread the word! Some dreary and chill weather in Blacksburg lately calls for a bright and cheery post. 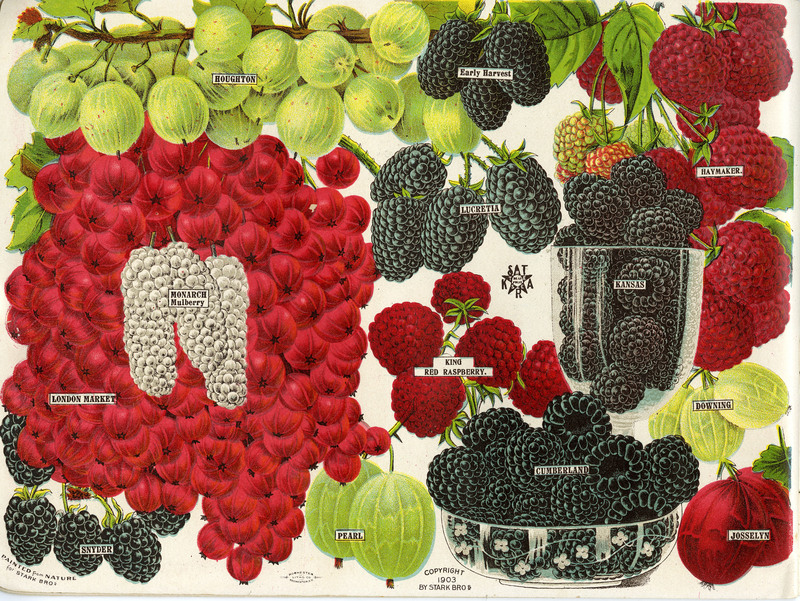 Enter the World’s Fair Fruits catalog from Stark Bro’s Nurseries & Orchards Co. 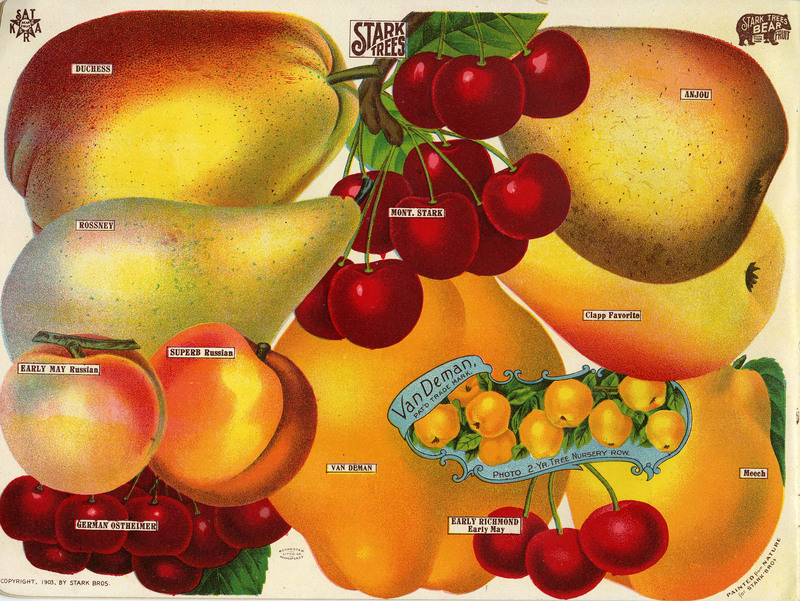 Created in 1903, the catalog included full page spreads of fruit varieties sold by the company (still in existence today and now simply Stark Bro’s). 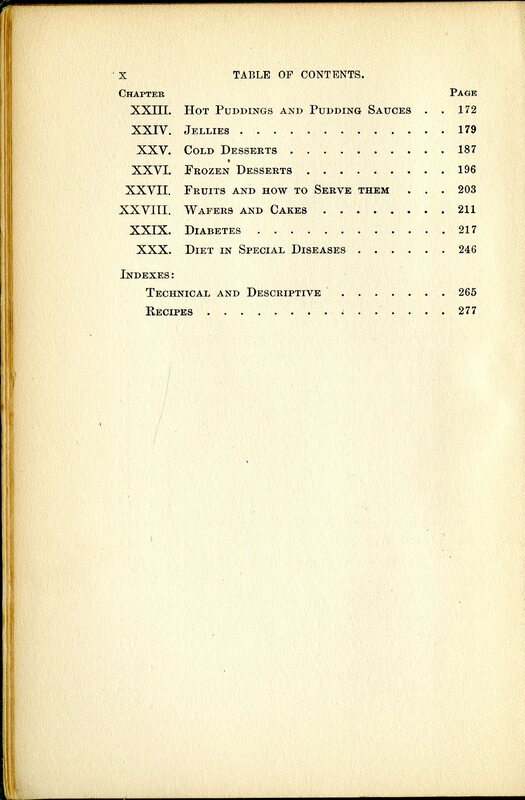 The catalog also contains detailed information on the history of the family company, established in 1816; black and white photographs of the orchards; and descriptions of the available fruit varieties. 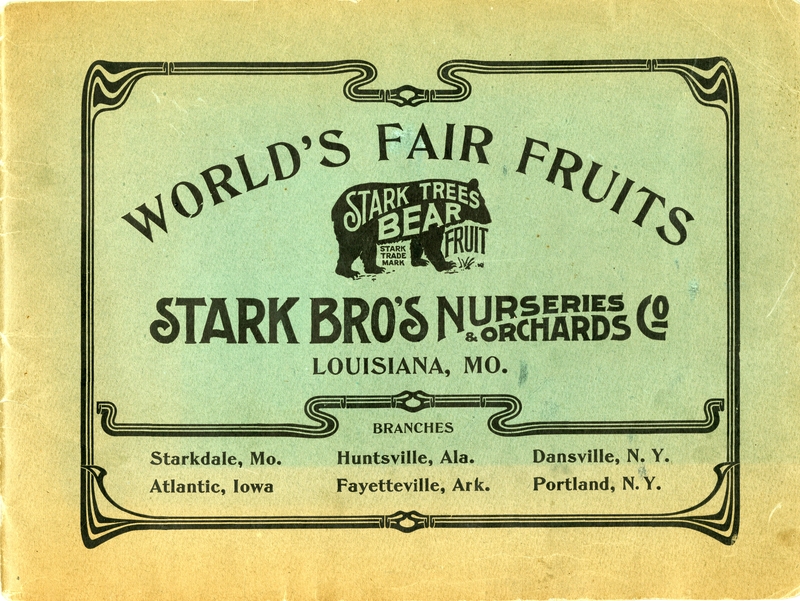 This particular Stark Bro’s catalog was produced for the Louisiana Purchase Exposition in 1904 (aka the St. Louis World’s Fair) in St. Louis, Missouri. 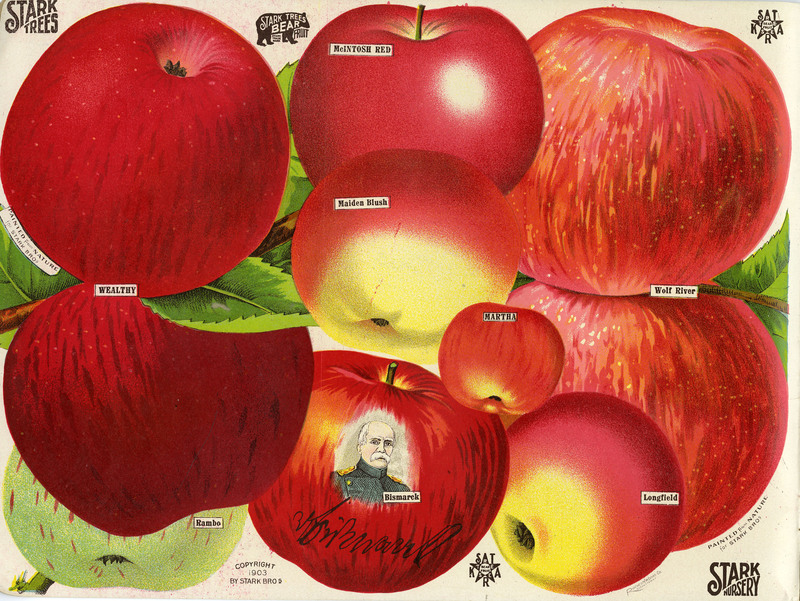 The copy of World’s Fair Fruits here in Special Collections is one only four or five in public and academic library hands. It’s rarity aside, we just couldn’t pass up the catalog once those color images caught our eyes. 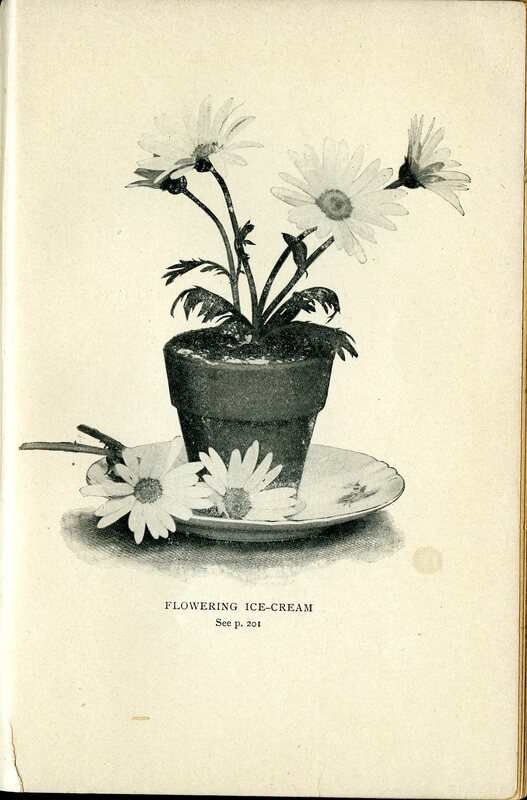 We have a number of other seed and nursery catalogs in our collection and while they may, at first, seem an unlikely addition, seeds and trees are a vital component to the larger picture of food and drink history we are documenting. Knowing who was providing these ingredients, where they were growing, and how they were marketed and shared 100 years ago gives us a little insight into foods we still enjoy today. And remember, there are likely to be wonderful (and local or uncommon) varieties of many fruits wherever you live. So, when the growing season arrives, be sure to get out there, try something new, and find a creative way to make it last all winter! Even if it means giving up half your freezer space to applesauce made in the fall (like a certain archivist/blogger here at Special Collections)–it’s well worth the effort.